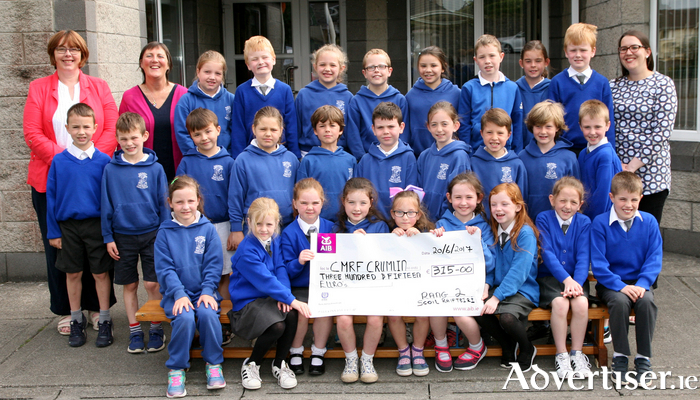 The 2nd class pupils of Scoile Raifteiri, Castlebar who donated some of their First Holy Communion money to Crumlin Hospitai with a cheque of €315euro and a cheque of €200 and a toy kitchen to the children's ward of Castlebar Hospital. Pictured are the pupils with their teachers. Photo: Heverin Print. There's lots going on around Mayo in the next few weeks and there's something for everyone, so why not check out what's happening in our Community Diary. Join John Sheehan, senior lecturer in archaeology, UCC, at 2.30pm on Saturday, July 1, for a special talk on the Cushalogurt Hoard of Viking silver - one of Ireland’s most important Viking Age finds, discovered on the shoreline of Clew Bay in 1939. Explore why Viking silver was often buried in the earth. Was it for safe-keeping or was it for a ritual purpose? Booking is required for this free talk for adults. Telephone the Bookings Office on (094 ) 90 31751 or email [email protected]. Why not take a guided historical tour of Castlebar with local historian and tour guide Brian Hoban. His summer tours have commenced and take place each Wednesday evening commencing at The Courthouse at 7pm. For many visitors to the town this tour is the highlight of their visit to Mayo. Among the topics covered in this fascinating tour are: (1 )The establishment of a castle by George De Barrie in 1235, (2 ) The granting of a Charter of Incorporation by King James 1st in 1613,(3 ) The defeat of the Redcoats in "the Races of Castlebar" on August 27 1798 , and (4 ) The foundation of the Land League by Michael Davitt in 1879. In addition tour will also take place on Friday mornings and Saturday mornings during July and August commencing at 10.30am. The annual around the lake, Furnace 10K walk in aid of the Mayo-Roscommon Hospice will take place on Sunday July 9 - starting from Derradda Community Center (just off the Newport to Mulranny Road ) between 12noon and 2pm. Come along and make a donation on the day or request a sponsorship card from Margaret at (086 ) 8335394 or Helen at (087 ) 2263540. Join in on this beautiful walk and support this worthy cause. Refreshments are served at the finish line. Mayo North East under the Social Inclusion amd Community Activitation Programme (SICAP ) are running a free one day practical guide to leaving home and living independently. The workshop will take place in Aras Inis Gluaire on Tuesday, July 11 from 4pm to 7pm. The workshop is aimed at leaving cert students who are making the move to further education or employment. There will be various speakers on the day, covering topics such as personal safety, time and money management,cooking basic meals and advice on finding a job to mention a few. For further information or to book a place call or text (087 ) 1840214. Balla Bingo continues every Monday night in the Resource Centre at 8.30pm. UniSlim in the Resource Centre every Thursday evening, for more information contact Sharon on (087 ) 7917851. The next Mayo Bri Support Group Meeting for people who have experienced a head or brain injury is on Thursday, July 6 in Le Cheile Family Resource centre, Tucker Street, Castlebar from 7pm to 8pm. All carers, family members, friends and people who have a brain injury are welecome to attend. Information and sharing of ones experiences on the night. Confidentiality is paramount to this evening. For more information mobile (087 ) 1685554. A Mini Vigil will take place at Knock Shrine on Friday, July 7 in the Parish Church. Confessions will take place from 8pm to 9pm followed by vigil until Midnight. All are welcome to this special evening of prayer. Free to be me Summer camps are specifically designed for the preteen age before hitting the teen and secondary system and have a positive mental wellness theme. With focus on self esteem, self awareness and emotional intelligence, the camps aim to deliver with a difference. Expression is promoted through individual needs of each group along with writing, music and movement, art, role play and a touch of meditation!Booking is essential as numbers are limited for more information call (085 ) 7297451. Camps will take place in the Maple Youth Centre, Ballinrobe from July 3 to 7; Ballyhaunis Family Resource Centre from July, 10 to 14; Ballina Family Resource Centre from July 24 to 28. The camps run from 10am to 1.30pm each day. The Castlebar GIY group meet second Monday of each month from 7.30pm to 9pm in Le Cheile Family Resource Centre, Tucker St, Castlebar for anyone out there who is interested in growing their own vegetables/plants etc. The next meeting is on Monday, July 10. The Mayo Branch of BirdWatch Ireland will be taking break over the summer. There will be more events organised for the Autumn and Winter. If you would like to be kept informed of future events, then you can join ther email list by emailing your details to [email protected] or by joining their texting service by texting your details to (087 ) 643-2340. Ballinglen Arts Foundation, Ballycastle will host a new exhibition "Boats of Bark" which opens tomorrow, Saturday, July 1 at 8pm. This work was created by Philadelphia Artist Randall Exon, while he was on residence in the foundation where he created these wonderful interpretations of the North Mayo Landscape. Get your dancing shoes on and get along to a series of mini-ceilis in Kilmovee's beautiful thatched cottage with Mildred Beirne. The mini-ceilis will be starting on Tuesday, July 11 from 8.30pm to 11.30pm and every Tuesday night through July and August. Admission is €5 and includes refreshments. All ages welcome. Claremorris Family Resource Centre is running its annual Spraoi Samhraid Summer Camp next month. The camp will run from Wednesday, July 12, to Friday, July 14, from 11am to 3pm each day in Claremorris GAA Club. The camp will cost €20 for the first child and €15 for any additional children from that family. There are two different age groups in the camp, one for four to seven year olds and the second for eight to 12 year olds. Activities will include fun with the Mayo Arts Squad, cupcake workshop, ukulele workshops, dance workshops, sports and much more. If interested contact Claremorris FRC on (094 ) 9377838. Book early to avoid disappointment as places are limited and will go quickly. Mayo North East Leader Partnership under the Social Inclusion and Community Activitation programme (SICAP ) in collaboration with Udaras na Gaeltachta are delivering a free start your own business course for jobseekers in Achill. The course is ideal for those who are currently unemployed and who may be looking to self-employment as a solution. The course will take place in Achill Sound Hotel and Connaughton’s Bar, Monday, July 3, Monday, July 10 and Monday, July 17 from 9.30am to 4.30pm. Booking is essential as places are limited. For further information or to book a place contact (097 ) 20828 or (097 ) 81418. The summer camp will run from July 3 to 7 and is a fun-filled week for age seven to 11 years. The camp includes arts and crafts, sports, prayer, dance, music, and much more. Each day runs 10am to 2pm. Children are asked to bring a packed lunch. The camp costs €30 and places are limited so booking is essential. Contact the Youth Ministry on (094 ) 94 75321 or email: [email protected]. Macra na Feirme has set up a Macra club in the Swinford and surrounding areas. It is holding a launch night on Saturday, July 1, in the Gateway Hotel, Swinford at 7.30pm. Anyone interested in joining Macra is welcome to go along. There will be special guests and spot prizes on the night. For further information, contact Ciara on (087 ) 1888082. Swinford Macra presents a night with the Galway boy himself, Mike Denver, on Friday, July 7, in Julians of Midfield, in aid of Swinford Macra na Feirme. Doors open at 9.30pm. Entry is €15 which can be paid on the door on the night. There will be a raffle, jiving competition, and more on the night. For more information, find it on Facebook. Claremorris Family Resource Centre is running its annual Spraoi Samhraid Summer Camp again this summer. The camp will run from July 12 to July 14 and will take place from 11am to 3pm at the Claremorris GAA Club. The price is €20 for the first child and €15 for any additional children from that family.There will be two different age groups in the camp, one from four to seven years of age and the other from eight to 12-years-old. If interested please contact Claremorris FRC on (094 ) 9377838. Book early to avoid disappointment as places are limited and will go quickly! Family Focus Week returns from the from July 10 to 15 at Family Centre, Knock Shrine. The programme includes daily evening and morning workshops, guest speakers and topics to engage and guide through the challenges of family life. For more information visit www.knockshrine.ie or call the Family Centre on (094 ) 75320. Story time for children up to five years of age, will begin on Thursday, July 6 and will run every Thursday, from 11am to 12pm. Also taking place in the library is a stitch and knit group, which will take place every Thursday, from 2pm to 4pm. For more information contact the library on (094 ) 9255934. The festival will run Saturday, July 1 to Sunday, July 2 from 11am to 6pm on both days in Holy Trinity Church Westport. The festival will have displays from local groups, individuals and florists, All are welcome to submit arrangements, no professional experience required just perhaps an original idea to help celebrate Westport 250 or in remembrance of a loved one or simply an arrangement you would like to make to create art and beauty in the lovely surroundings of Holy Trinity. There will be a set up day on Friday, June 30 from 10am to 5pm so just come along with your display. For more information contact Maggie on (087 ) 4117165. Exercise classes for women take place every Wednesday morning 11am to 12pm in Ballina FRC, Ardnaree. For further details contact (096 ) 75573.